Secret Photos will allow you to turn your photos into puzzles and create gifts for your friends using e-mail. 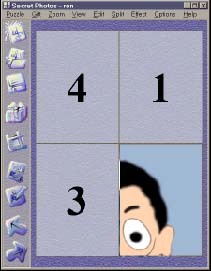 Your friends will be thrilled with the gift - to see your photo they need to first solve the puzzle! Be careful - your friends can send you the same kind of puzzle of their photo and you will have to become a detective!